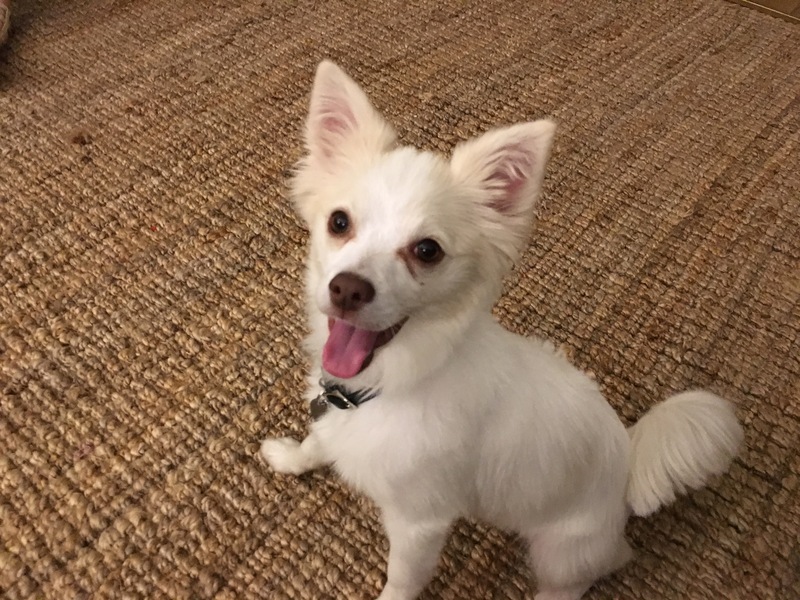 Zoro is a very high energy, one-year-old Pomeranian Papillon mix who lives in Los Angeles. His guardians called me in to help put a stop to his habit of barking when left alone, mouthing, nipping and jumping up on people and overall obedience. At first Zoro seemed like an average one-year-old dog. He was excited at the door, but not overly so. I disagreed when he tried to jump up on me so that I could establish the leader follower dynamic I wanted. I sat down to discuss all the issues the guardians had and explained where the dog was coming from. I also asked a number of questions to determine if Zoro was getting the exercise, stimulation and enrichment he needs to develop into a confident, balanced dog. In the course of this conversation, Zoro started getting a little rambunctious, chewing on the carpet, running around excitedly and showing no respect for the guardian’s personal space. It wasn’t hard to see why; each time Zoro got near them, his guardians reacted over and started to pet him. Over time can create a mindset in the dog that it can tell the humans when its time to pet him. Because the humans petted him when he asked it and they didn’t really have many rules, Zoro had gotten the impression that he had the same authority as the humans. To help change this perception in the dog, I showed his guardians how to Pet him with a Purpose. While Petting with a Purpose will help the family develop a healthy leader follower dynamic with the dog, Zoro’s primary issue is way too much unused energy. Your average one-year-old puppy needs a good 45 minutes of exercise a day. For a high energy dog like Zoro, he needs an hour or more. Because the family includes two young children, I strongly suggested that the family look into a doggy day care to try out for a week. I think they are going to see a HUGE improvement in their dog if Zoro goes to a good dog daycare every day for a week. In addition to burning his excess energy, the interaction with other dogs will teach Zoro not to bite and mouth people. I also wanted to show the guardians how to walk Zoro in a strutted way to help burn energy and develop the dog’s respect for the leadership of the human. Earlier in the session, I had shown the guardians how to claim objects and territory. I wanted to show them how they could put this technique into use for a practical application. One of the family’s issues was the need to keep the door to the children’s play room closed to keep Zoro from stealing or chewing on their toys. I had the father go into the room with my camera so he could film me as I claimed the room and established a boundary in the open doorway.